This document describes the purpose, guiding principles, and overall vision for Transatlantic Poetry on Air to continue to bring poetry to new audiences through the use of cutting-edge technology. 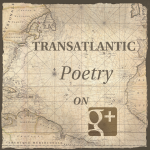 At the heart of Transatlantic Poetry on Air is the Google+ Hangouts on Air technology. This enables poets and their host to connect from different geographic locations in live multi-video readings and conversations, which are subsequently streamed live via YouTube. A mechanism for those tuning in to ask questions also allows the poets and the host to interact with the audience in live Q&A. These readings are archived on YouTube indefinitely for subsequent replay. Transatlantic Poetry on Air is also a platform comprised of the many different parts that make these events successful. This includes support for training new hosts in best practices, support and technical help for the poets, and well-documented tips, standards, and best practices, developed iteratively through practical experience, to make the readings successful. The platform also includes a growing Google+ community of people interested in attending the readings, as well as a Facebook page and a web portal. 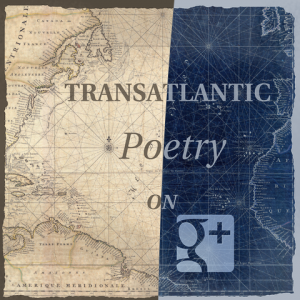 The hashtag #tapoetry is in use on Twitter, Facebook, and Google+ to identify conversations about the Transatlantic Poetry readings. In service to its aim to support poetry, Transatlantic Poetry on Air partners with select organisations that have a strong commitment to the same goals and a proven track record of making a positive difference. This includes poetry societies and groups, as well as literary journals. Such an organization should also have a strong connection to a network of poets on both sides of the Atlantic, and a commitment to produce high-quality online readings and events. Transatlantic Poetry on Air’s open aim with partners is to “be the flower” pollinated by many sources. For example, Partner A might host an event one month, advertise the event to its base, and bring X new members to the community. Then Partner B hosting an event the next month gains the benefit of exposure to X new poetry-lovers that they might not have otherwise reached. By providing an open platform for many groups to participate in partnership, everyone benefits—partners gain access to new audiences, poets gain exposure in ways that might not have otherwise been possible through traditional readings, and the Transatlantic Poetry community grows strong through multiple influences. What Transatlantic Poetry on Air ultimately represents is something greater than the sum of its parts. It is a manifestation of the growing trend of communication technology breaking down geographic barriers for poets and poetry-lovers to connect. Furthermore, the approach is economical, environmentally friendly, and accessible for those with restricted mobility. In addition to the technological paradigm shift, enabling us to engage poets and their audiences in new ways, there is great interest overall for poets and poetry-lovers to connect globally. Poets on one side of the Atlantic recognise that they have much to gain from exposure to their counterparts across the sea. Transatlantic Poetry on Air therefore lies at the intersection between what poets and poetry-lovers increasingly want, and what is increasingly possible. Transatlantic Poetry on Air aims to produce enjoyable, high-quality experiences throughout the lifecycle of each event for everyone involved. It aims also to be guided by its stated purpose and principles to evolve and expand over time, making it a fulcrum for the upliftment of global poetry in the twenty-first century. Click here for the latest news and updates from the Transatlantic Poetry community. Categories: Community and Poetry. Tags: Transatlantic Poetry.